Liverpool’s Premier League hopes appear to be faltering as the Reds once again dropped points in Sunday’s 0-0 draw with Everton. Despite creating a number of chances, Jurgen Klopp’s men still failed to grab all three points. Just a few weeks ago Liverpool were having a seven-point lead at the top of the Premier League table, but have since relinquished that advantage to Manchester City. The goalless draw with Everton means Pep Guardiola’s side has now leapfrogged Liverpool at the top of the Premier League table, and currently lead the Reds by a point. "Very, very difficult game for different reasons,"
"A wild opponent and - I know people don't like it when I say this - the wind came from all different directions, you saw that in a lot of situations. "It didn't help any football play, especially when the ball was in the air which it was a lot. In a game that was difficult to control because of those things, we had I think three or four really big chances." "It's 0-0 in a derby, we keep our unbeaten run against Everton but, of course, it's not exactly what we wanted but it is easy to accept because it was a difficult game." 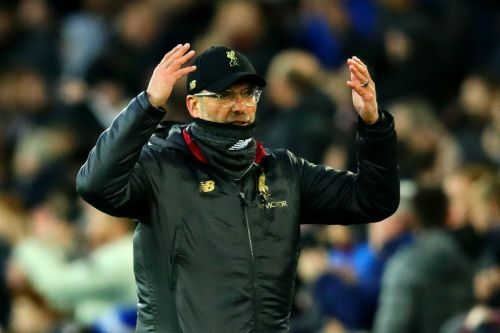 Klopp’s comments – some have described it as an excuse – comes after he said injuries to Manchester United players disrupted Liverpool’s play during last week’s 0-0 draw at Old Trafford. The Reds manager has since been trending on Twitter, with football fans reacting to his post-game comments. 🗣 "The wind didn't help." 🗣 "The pitch was difficult (due to snow)." 🗣 "The wind doesn't help." Klopp describing his defeats in postmatch interview like..